Tiffany & Co has launched Tiffany Intense, a new fragrance for women. Tiffany Intense is a flanker to 2017's Tiffany & Co Eau de Parfum. Tiffany & Co. unveils Eau de Parfum Intense, a richer and deeper version of the signature artisanal fragrance. Tiffany Eau de Parfum Intense is a powerful musky & floral interpretation of the original wrapped in a warm, sensual accord that takes the juice a step further. The key note, a richer concentration of iris butter echoes its predecessor with a deep intensity that adds extraordinary depth. The dry down strengthens in opulence through luxurious raw materials of amber and benzoin. Once again, world renowned Master Perfumer Daniela Andrier created this scent inspired by optimism, strength and joy, a pure essence of the Tiffany brand. 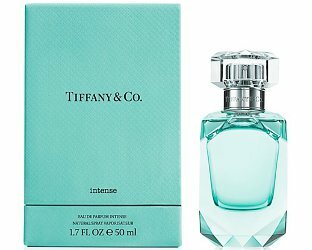 Tiffany Intense is available now at Bloomingdales, in 30 and 50 ml Eau de Parfum Intense. Well, it’s the perfect colour. Are their scents any good, or should I save up for a canary diamond? I don’t know — I did not try the first one, and didn’t hear anything great about it to inspire me (consensus seems to be “pleasant”). This color is better than that one though! The original smelled like “generic mall perfume” when I did a quick sniff of it. I didn’t try it on skin. The first one is pleasant, but honestly, I had trouble smelling it. The original Tiffany and Trueste are very good. Both long discontinued though. I will try this if I see it. Yes, I know there are still many fans wishing they’d bring back the original Tiffany. I don’t think I even knew about Trueste! Trueste is the better of the two imo. I wore it for my wedding. It was big, in the way of Poison and Champagne.